I am a maker from birth. I love playing and experimenting with electronics, robots, radios, and anything else technical. I retired from the military and have a Masters degree in Mechanical Engineering. I am passionate about teaching Science, Technology, Engineering, and Math (STEM) topics and started Subsystems to distribute education modules to anyone who wants to learn cool things. The watch is very well build, does what it is supposed to do and the setting procedure is easy and smart. You must read the instructions to set it but it is very smart as you have only one button. What I don't like is the velco as it is to hard on my wrist. I will find another wristband and then everything is perfect. The battery seems to last very long without being recharged. I owned a RadioShack Microcomputer Trainer when I was a kid. I liked it so much that I wanted to build another one. So I used the schematic from the manual to find parts and build my own. Unfortunately, I could never find a replacement TMS1100 IC that would work. Fast forward to my first Arduino, I'm thinking "I wonder if I could make this thing emulate that TMS1100 IC" but I never got around to it. 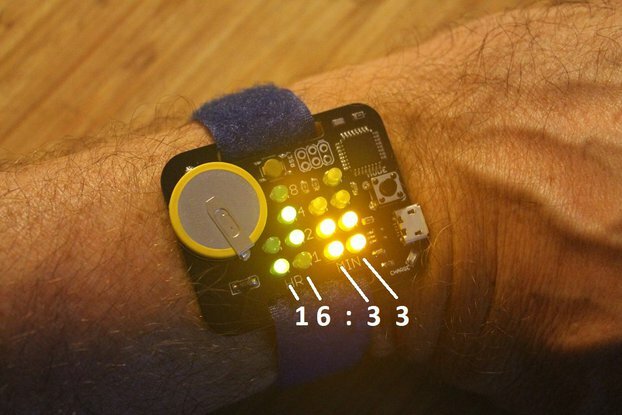 Then one day I see this thing on Tindie and my mind bursts for joy. Not only is it really well built, the learning material is really well done as well. The only thing that I would ask to make this better: the source code that runs the thing and some info on how to hack/modify it.